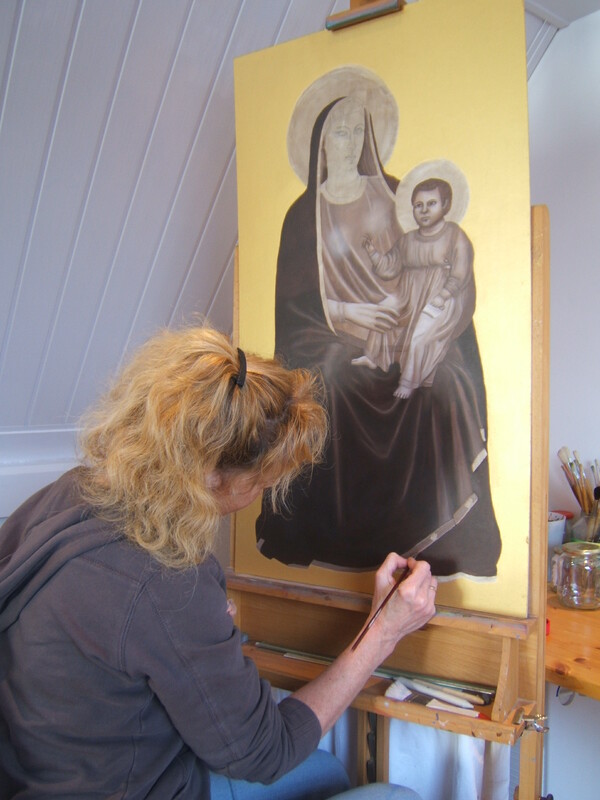 The works of visual artist Diana Kreikamp consists of portraits and drawings created from photographs, classic oil paintings, realistic and free hand creations made in acrylic . When creating portraits from photographs, she only uses a pencil. The contrast between light and shadow allow the natural shapes and forms to stand out as harsh lines blend in softly with the background, resulting in a depth bringing the portrait to "life". Carefully capturing the aura of the subject offers a rare view in the unique being that is the human soul. Oil paintings are exclusively created on panels or canvas materials. Utilizing only these mediums, Diana follows the techniques of the old Masters of the Renaissance period, for example Raphaël, Michelangelo and Giotto. Starting with a base-painting, using only two colors, the details of the sketch will be fine tuned in both light and dark coloring. After this is completed the work is "heightened" by applying three different shades of white paint, causing an almost bluish glow. The next stage of the process entails the application of glaze, covering the work with various layers of transparent paint. To fully know what each one of the colored layers will look like when applied upon one another, takes not only masterful talent and skill but also a thorough knowledge of colors. It is quite a time consuming process as each layer has to be completely dry prior to the application of the next layer. In this stage, the painting is once again "heightened" allowing the beautiful lights to create depth in the resulting art work. Detailed painting with acrylic demands a totally different technique and skill. It starts with large, transparent areas that will eventually show off the tiniest of details when finished. Acrylic, completely the opposite of oil paint, is a quick drying medium. When painting "wet on wet", the best way to successfully accomplish working with this medium would be to handle several brushes at the same time. Diana also creates original freestyle art, using acrylic as a medium. Completely letting go of all techniques, used in her other art works, she allows her heart to speak and listens to what originates from within. Diana does not create base drawings or designs and as she mixes the colors on the canvas, beautiful shapes and forms appear, culminating in a wonderful and truly original "Diana Kreikamp".